What does the planet do with electronic waste? It’s a perplexing problem that is reaching unfathomed proportions. Certainly we need the electronic products…everything from computers to keyboards to printers, etc., but when they’re outmoded or no longer wanted, where do they go? What do we do with them? Often they go into landfills and pose environmental threats by putting dangerous elements into the landfill that future generations will have to deal with. That does not bode well and must be dealt with. Mr. Fava also zeroed in on electronic e-waste. “The importance of erasing hard drives securely and completely to remove all data from storage devices can’t be understated.” He noted that eGreen Recycling “provides detailed reporting of erasure and auditable, verifiable assurance that all data was sanitized in compliance with National Institute of Standards and Technology (NIST) and all other existing standards”. The meeting concluded with a lively question and answer session. 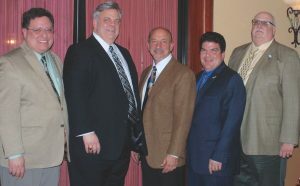 L to R: Andrew Bader, Ray Averna, Philip Fava of eWasteRecycling, Vin Abbatiello, Bill Schuckmann.